I must acknowledge Bronwyn my partner who is my good fortune (which we all need). She is also a wonderful writer and artist (and spots birds long before I do). One important fact fleetingly mentioned is that this is Gumbaynggirr country. We live next to Jagun Nature Reserve – Jagun means home or dwelling in Gumbaynggirr. Gumbaynggirr culture is very valuable, important and knowledgeable. (Deep Creek is Miilba). But not even the Dreaming goes back to our beginning as ancient star matter. All of our atoms are billions of years old. Hydrogen, the most common element in the universe and in the body, was forged in the Big Bang 14 billion years ago. Heavier atoms (carbon and oxygen) were manufactured in stars around 10 billion years ago and strewn through the cosmos when those stars exploded. I forgot to mention Pink Bloodwood a dominant tree species of Jagun. A second flowering is happening right now (Feb). Some Bloodwood trees are ceremonial and the sap-like kino is used as a salve. Bloodwood is ‘a black fella’s bandaid. You get the sap from where it is bleeding. You can smear the sap of this tree on your cuts and scars, and it helps heal and reduce scarring.’ Uncle Milton Duroux. • We need to pay more attention to the total world of nature, for our sake and that of the natural world we have co-evolved with. The ambition of Eos is to encourage people to find the time to feel close to the earth, to enjoy the sublime and the beautiful in nature, the two concepts need not be antagonistic. For Edmund Burke the sublime was infinite, irregular, vast and terrifying; the beautiful was small and regular. The notion of the sublime was revolutionary because it took emotion seriously. Edmund Burke thought the sublime was a more intense and powerful feeling than the beautiful because it involves a sense of menace and destruction, linking the emotion of the sublime to our strongest instinct, self-preservation. The sublime is beyond both reason and imagination in contrast to beauty. The beach is littered with exquisite examples of beauty (small, smooth and delicate objects) shells, Glaucus Atlanticus, washed and polished stones. Eos just asks you to be present to both, and realise that reason and imagination and emotion cannot be neatly segregated. Both the beautiful and the sublime interfere with boundaries separating the conscious and unconscious, reason and unreason, self and cosmos. Eos helps us to creatively see anew what is already there. Eos offers us wonder that has three dimensions: 1. Wonder, like the sublime, has an emotional effect, we feel wonder; 2. Wonder is a cognitive dissonance, we can’t easily file away the experience and; 3. Wonder connects us to a larger dimension that could be described as spiritual. The word spiritual means nothing to me but I imagine that at its basis is a sense of belonging, of being connected to something much larger. Natural aesthetics offers richer and multi-sensory experiences compared to the fine arts. (See my recent post The undervalued sky). The quality of light Eos offers is subtle and remarkable, gently erasing the shadows we have lost the art of seeing. Junichiro Tanizaki marvels at the traditional Japanese, ‘comprehension of the secrets of shadows, our sensitive use of shadow and light.’ We have lost darkness, now we suffer blinding high-pressure sodium lighting that stab sharp shadows. Nothing is subtle any more, the charms of Eos slowly wearing away the darkness are rarely felt today. Eos soaks up the darkness that seduced Keats. In his ‘Ode to the Nightingale’, a little light shines in the darkness, ‘tender is the night’. The sense of sight recedes leaving smell, taste and hearing and access to a new world, and an escape from the old one of illness and death. He empathises with this world that he hadn’t paid attention to before and even listens to the flies yet feels lost to reality as the songster flies away. I briefly mention the need for science. Prior to Descartes, ‘knowledge’ was a conspiracy of Scripture, heresy, tradition, experience and speculation. One impediment to bridging the sciences and arts is our heritage – Greek aiesthesis was opposed to noesis (conceptual thought) and poeisis (the making of objects). This separation was a mistake, one of many unfortunate distinctions constructed by the Platonic, Christian and Cartesian traditions of the West that still divide embodied wholes into parts. Reductionism usefully explains certain causal functions, but is much poorer at understanding ecological relationships. Mind/brain/body and environment are not mutually exclusive domains, respectively mental and private or material and public. I mention science without mentioning technology – the two are entwined now. They have a bad name in some quarters but the problem is scientism and technocrats and the systems they are embedded in. Our crisis is partly caused by technology, the plastic pollution I mention, the ozone hole and global warming, chemical poisoning of the soils and waterways, destruction of habitat through development and agriculture . . . I could go on. Langdon Winner suggests that technological innovation is tied to social, economic and political processes, and technopolitical sphere is oppressive, threatens our natural and cultural systems and should be subjected to limits. Winner fears that industrial technologies have become institutions that rule our ways of life and ‘eliminate other forms of human activity’ (industrial techniques eclipses craftsmanship, agribusiness puts small-scale farming out of business etc.). So how have we come to this situation of being rapacious consumers in a capitalist system (and relatively content consumers, there are worse systems). Technology alone (including printing and the agricultural revolution of ‘Turnip’ Townshend) does not account for the dramatic rise of capitalism in Europe. Jan DeVries has written about the ‘industrious revolution’, where consumer demand for the new wider range of goods convinced people (including women and children) to work harder. Joel Mokyr cites cognitive, cultural, and intellectual changes from the scientific revolution, and economic change occurring as a result of new partnerships between engineers, inventors and investors. Others think institutional change in the banking sector and the market was the catalyst. It’s probably a combination, but the ‘Spirit of capitalism’ can be viewed as a three stage process still evolving. First, the 19th C bourgeois entrepreneur/industrialist adopted speculation and innovation, and usually displaying personal parsimony and family/social values. Then in the 1930s, the company director of large, bureaucratic corporations emerged. Since the 1970s that model is in flux, augmented by an insidious proliferation of networks: ‘financial markets versus countries; financial markets versus firms; multinationals versus countries; large order-givers versus small sub-contractors; world experts versus enterprises; enterprises versus temporary employees; consumers versus enterprises.’ The environment loses out in all these formations. Capital is global and market institutions do not value the natural. The multinationals (avoiding tax) are the engines that are sinking the natural world. Gretchen mentioned the issue of being distanced from experiencing Eos by using a camera or writing technology. David Abram also worries that writing, combined with the change in how we think (now all about rationality) distances us from our archaic roots of perception. He suggests experience is becoming mental instead of sensual and participatory. He doesn’t suggest we give up writing, ‘Our task, rather, is that of talking up the written word, with all of its potency, and patiently, carefully, writing language back into the land. Our craft is that of releasing the budded, earthly intelligence of our words, freeing them to respond to the speech of things themselves – the green uttering forth of leaves from the spring branches.’ Language helped us evolve. At some stage hominids stripped speech sounds of their associated meaning and reserved meaning for combinations of sounds strung together, expanding exponentially the range of meaning – this was the revolution of syntax and the use of convention was key. The camera is casually held in my right hand, holstered occasionally, it has become part of me. The act of pressing a button on the camera needs little embodied skill, and it seems the light does all the work, but the act is situated in a complex network of the physical, emotional, mechanical, aesthetic and social. Eos is forgotten by most, but offers her presence and photographing her is a little like drawing – the camera’s product, the image says, ‘I was here’. Long before Instagram, Facebook and mobile phones, Susan Sontag argued that everything exists in order to be photographed, ‘Photographs actively promote nostalgia. Photography is an elegiac art, a twilight art. Most subjects photographed are, just by virtue of being photographed, touched by pathos.’ Nostalgia is a common cognitive and emotional response to loss, change and uncertainty which fills our current ways of living, characterised by job insecurity, diminishing social capital, and rapidly increasing speed of communications and travel. Nostalgia is characterised by a longing for something past, out of reach it. Eos resists this daydreaming. ‘Solitude is sublime’, wrote Keats in October 1818 to his brother George. A few years later, Hazlitt recalled an enchanted place in Wales, ‘but I would return to it alone. What other self could I find to share that influx of thought, of regret, and delight.’ Eos is not a hermit’s solitude, but a temporary place of quiet and aloneness close to what Martin Buber termed ‘a place of purification’, more a nourishment for one’s return to the street, café, office, phone, family, society. Psychoanalyst Adam Phillips links solitude to creative work: ‘A productive solitude, the solitude in which what could never have been anticipated appears, is linked with a quality of attention.’ Eos frees you to stand, sit, walk, practice tai chi, write, meditate, stare. Sometimes I bring a bag and collect the bits of plastic and foam rubbish that ends up on the shore (there’s never much). Eos gives space and time. From Paleolithic hunter/gatherer to Neolithic farmer to medieval craftsman to factory worker, work has been integral to daily existence, but it was based on human time. Time emerged once our nomadic ways ended, and that time was measured in days not hours or minutes, which had to wait for the factory hooter and factory clock. Eos time ends as the sun comes up and my camera struggles to make sense on its own terms of the flooded ocean. Gretchen suddenly brought up the moral notion of decency. I should have said that the way we lead our lives in the developed world is not decent (but not bad or evil). Our eco-footprints are too big. Last year, Earth’s ‘overshoot day’ – the day each year when our demands on the planet outstrip its ability to regenerate – came on 13th August, six days earlier than 2014. The world’s population currently consumes the equivalent of 1.6 planets a year. The world is finite. A Sustainable Future seems out of reach. It requires individuals, corporations and governments to refrain from harming the continuation of natural processes of change, and not damaging our natural or cultural environments long term – while providing for present and future economic and social well-being of all. What ambition! Eos pushes an ethics of attention, being sensitive to what’s going on in your place and globally, since everything is now interconnected. Attention to one’s interactions with the environment from exchanging breath, gardening, flying, putting out the rubbish is difficult when you have a tough life, job, kids, or are ill, even depressed and the consumer culture we are all immersed in discourages such attention. Moral reasoning and knowing what to do Martha Nussbaum notes, ‘is not simply intellectual grasp of propositions; it is not even simply intellectual grasp of particular facts; it is perception. It is seeing a complex, concrete reality in a highly lucid and richly responsive way; it is taking in what is there, with imagination and feeling.’ Hence she argues for the importance of literature and the arts. Virtue Ethics looks at the questions the Greek philosophers were interested in – How should I live? What is the good life? Aristotle believed that the purpose of human life is to achieve eudaemonia, fulfilment, happiness or more accurately, as Nussbaum translates, flourishing. Decisions arise from the character and attitudes of the moral agent (who is presumed to want to behave morally). What is called Virtue Ethics (as opposed to forms of utilitarianism or consequentialism) looks at the human being as decision maker. Some actions seem wrong even if they lead to the best outcomes (consequentialism). From this perspective, feelings, intentions, knowledge, skills, motivations and character all play a part – and there is not always the right thing to do – life is messy. Friendship, enmity, love, jealousy, loyalty or fear can all play a part. It’s as complex as defining the difference between ethics and morality, the former being more abstract and culturally conditioned. I am just lucky that decency does not need bravery right now. Moriz Scheyer, Peter Singer’s grandfather and a central Jewish figure in Thirties Viennese cultural life, was in danger from the Gestapo. The Rispal family, with no obligation or connection, risked their only son’s safety to help Moriz and his wife to hide in the French convent of Labarde, which housed the mentally disabled and incurably ill. Moriz asked: ‘Would I have behaved in the same way if the position was reversed? I do not know the answer.’ We just don’t know. Aldo Leopold’s 1949 book, A Sand County Almanac, anticipated the concept of biodiversity and founded the notion of a ‘land ethic’ respecting plants, animals, and humans. Leopold’s most explicit statement on this ethic is: ‘In short, a land ethic changes the role of Homo sapiens from conqueror of the land-community to plain member and citizen of it. It implies respect for his fellow-members, and also respect for the community as such.’ The concept of Land Ethic has led to the notion of ecocentrism (or biocentrism) which broadens the ethical beyond human society (and further than animal rights promoters might want to go). Holmes Rolston, a founder of environmental ethics, promotes biocentrism as respect for the flourishing of every living thing. Complex life forms evolve and survive only in complex diverse ecosystems, so he argues that we have a duty preserve them to enable the ongoing evolution of the world (including human mental and cultural life). I’d add that we are symbiotically connected to the world. Humans are large and complex organisms, one drop of blood contains about 10,000 while blood cells and 250,000 platelets, but only about 10 per cent of our cells are human, and the rest belong to the trillions of micro-organisms, mainly bacteria, living on or inside you. Rolston now talks of earth as the ‘ultimate survival unit’ to be respected and cared for, its biodiversity protected. I mention we are all connected by our breath, but in many other ways we are interconnected with all of life. We are all descended from a single ancestral form of life. The same processes and tools are busy at the cellular and molecular levels among all living organisms despite the apparent diversity. Life’s chemical pathways are shared. The same processes and tools are busy working away at cellular and molecular levels among all living organisms despite our apparent diversity. Bacteria, plants, fungi and animals share metabolic pathways, RNA, protein molecules and ATP. And we share DNA that code for protein molecules. We share 30% of our DNA with lettuce. The eukaryotic cell with membrane-bound nucleus and containing organelles, like mitochondria or chloroplasts that power the cell and providing metabolic functions and many others that process protein and lipid synthesis and degrading, and provide structural support and cellular movement. The current hypothesis on the origin of chloroplasts and mitochondria, suggests that they began as cyanobacteria and aerobic bacteria, respectively and became incorporated symbiotically. (Lynn Margulis’s theory of endosymbiosis, or SET – serial endosymbiotic theory). Eos helps us pay attention to what is important and would be good for young people who need to learn to be present in the moment, and socially aware and aware of their living reality. There is now the possibility of instant access to news, and myriad modalities of information. The danger of Albert Borgmann’s information overload (or Theodore Roszak’s ‘data glut’) is a common corollary to the mistaken belief that vast amounts of information lead to knowledge, intelligence and wisdom. North Americans spend an average of five and a half hours a day with digital media and more than half of that time on mobile devices, and a UK study found that we check our phones 221 times a day, an average of every 4.3 minutes. David Abram, as I mentioned above, worries experience is becoming mental instead of sensual and participatory, even before the digital world. Nir Eyal argues that Facebook relies on ‘FOMO’ (fear of missing out). Social status is quantified through numbers of likes, comments, and friends. He believes that checking in delivers a hit of dopamine to the brain, plus a craving for the next hit. He thinks the photo-sharing app Instagram is an even worse, moving beyond a generalised FOMO to ‘the fear of losing a special moment.’ Too often you miss a special moment glued to a screen. 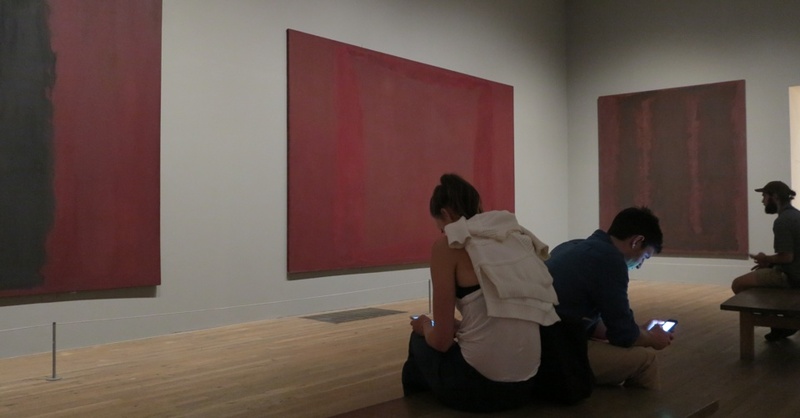 I mention the Seagram series of paintings in the Tate, paintings Mark Rothko wanted isolated in a room for viewers to meditate on. I was distracted, had to get my camera out. Many young people are addicted to the digital age without realising it. They use machines to avoid social interaction, which means they become maladjusted to social situations. Real world cooperation with others is an important skill, but social media encourages exclusiveness and cliques. Real world interaction with the real environment is important. Eos is against all false hopes and transcendent notions like liberty, freedom and eternity, concepts that are given life by writing, but which are used to obscure the detailed time signatures, play of light, fresh air, bird song and what is unfolding with Eos (a randy goddess), Eros and Thanatos. Eos is apart from the everyday, and yet has the potential to inform and enrich everyday life. I note that I am content in my place, but I have had plenty of adventures. Here is one from Pakistan a ten minute mp3 piece. Australians have a responsibility to be cheerful and positive, and that Eos and the arts can help. Australia has deadly snakes, spiders and saltwater crocs, but the marsupial leopard, which may have been up to 100 kilograms in weight, is extinct. And so is the megalodon —a giant shark with the most powerful bite of any creature that has ever lived, it weighed up to 30 times more than the largest Great White. The vast majority of Australians seem to have little idea how lucky they are living without famine, major wars or epidemics, and with access to education, healthcare, food, water and shelter – let’s not whinge. Let’s get the most out of the world without taking so much out of it.